Noble Life Sciences is a full-service preclinical contract research organization offering standard GLP and non-GLP services, including safety and efficacy testing, for the development of drugs, vaccines, and medical devices. We offer preclinical testing in a wide variety of mammalian species including rabbits, rats, mice, ferrets, guinea pigs, sheep, goats, domestic swine and mini pigs. Our services also include the development of disease and animal models, the production of GLP and non-GLP custom polyclonal antibodies, the derivation and maintenance of animal breeding colonies, and animal housing and husbandry. Noble has more than 15 years of experience contracting with vaccine, medical device and drug manufactures to conduct GLP submissions. Examples of these studies are single and repeat dose toxicity, local tolerance, efficacy and safety, reproductive and developmental toxicity, biodistribution, and ocular and skin irritation evaluations. These studies have been conducted in rabbits, rats, mice, ferrets, guinea pigs, sheep, goats, domestic swine and mini pigs. From proof of concept studies to preclinical safety and efficacy studies, Noble Life Sciences has a wide range of services to meet your needs. 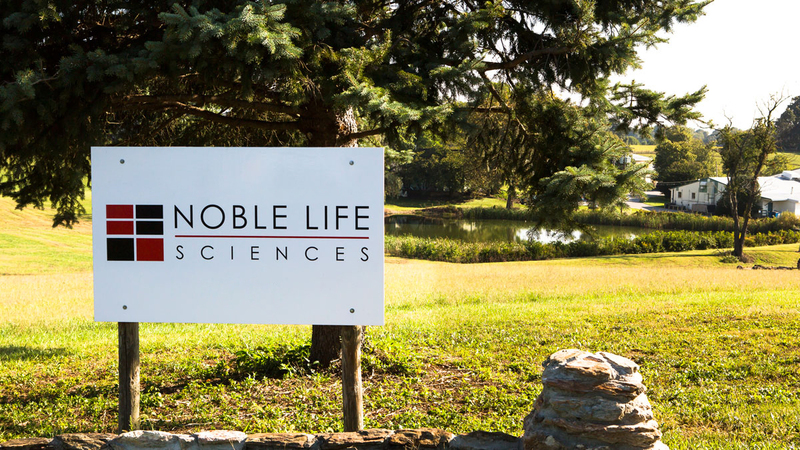 Noble Life Sciences’ facility location in Maryland makes Noble easily accessible to clients in the BioHealth Capital Region and throughout the mid-Atlantic. The facility is operated with strict confidentiality policies to protect client proprietary information. We conduct our operations with strict adherence to an extensive set of standard operating procedures (SOP’s) that cover all aspects of animal care, animal procedures, equipment operation and facility operation. Noble Life Sciences has more than 15 years of experience contracting with vaccine, medical device and pharmaceutical companies to meet their needs from discovery to GLP preclinical studies for FDA submission. Noble provides all aspects of the GLP process from design to regulatory support of your IND, IDE or PMA FDA submission. Our PhD and Masters level scientists will guide you through the study process while our ALAT, LAT, and rLATg technicians will meet the technical requirements of your study. Our quality assurance professionals and veterinarians have over 25 years of experience in the industry. We encourage and provide resources for staff to continually obtain additional training, including AALAS certification at job-appropriate levels.